By Arthur ChuParker Rice is a 19-year-old freshman. The fact that he chose to lead the chant speaks volumes to his personal character, yes, but the fact that others joined in speaks to the culture surrounding him. There’s no way he wrote that chant himself and then, spontaneously, a formerly non-racist and accepting frat suddenly decided to take it up en masse just for fun. John Shaw is a municipal bureaucrat. He says he’s not some kind of mustache-twirling Grand Wizard of the Klan, and I believe it. I even believe him when he says he and his colleague Judge Bhad no conscious racist intentions–and I certainly don’t believe that the problems in Ferguson suddenly started when he took his position eight years ago. The overwhelming theme of the DoJ report is that Ferguson’s bureaucracy was hungry for revenue and Shaw and his colleagues were simply trying to meet that need. The logic of capitalism and racism, as always, intertwine–money must be accumulated one way or another, and in a racist society it turns out the easiest people to put the squeeze on is black citizens, nothing personal. And if having to do a job that–for simple economic reasons–is a racist job starts to attract cops and clerks who are overtly, consciously, virulently racist, well, that too is just supply and demand at work. 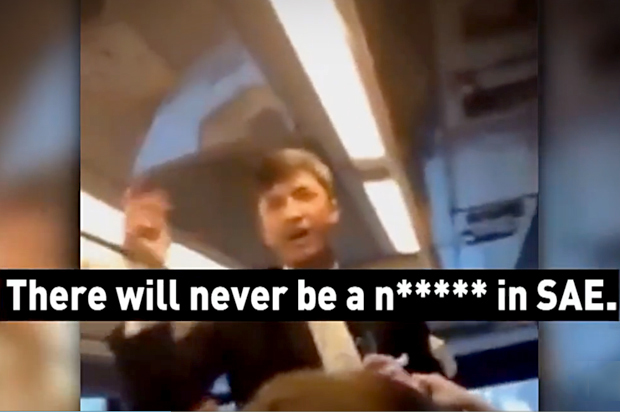 A bunch of fratboys don’t develop an oral tradition of singing racist chants laughing about lynchings without racism being deeply woven into the culture of our fraternities, our schools, our whole society. A single small town doesn’t systematically put its black citizens under apartheid to generate revenue–a town’s officials don’t feel safe joking about its black citizens as subhuman–without racism being deeply woven into our politics, our legal system, our methods of policing. The urge to find a single scapegoat after a tragedy is overwhelming. And unlike the common use of the term “scapegoat” I’m not saying these people don’t deserve what they get–just as Michael Brown (the other one) deserved to be raked over the coals for the aftermath of Katrina, just as the buck stopped with George W. Bush for the war in Iraq, just as in most complex human tragedies there nonetheless is a specific person who, through negligence or malice, pulled the fatal trigger. But it’s ridiculous to say that our history would’ve been completely changed if Bush had died or been incapacitated after choking on that pretzel in 2002–a Cheney presidency would’ve been no different. It wasn’t him, it was the apparatus around him, it was the cultural and political and legal mechanisms that got him elected in the first place, and if you replaced him with another guy from the list of Republican candidates he got drawn from it’s hard to see how history would change. Just as if Parker Rice hadn’t pledged SAE we’d see that same video only with some other fratboy douche leading the chant. Just as if Darren Wilson hadn’t been on patrol that day some other cop would, eventually, have shot some other unarmed teenager (as we can tell by the number of other atrocities that have happened in the past few years across the country). Just as if Capt. Henke and Sgt. Mudd had never been hired there’d be two other civil servants comparing the President to a chimpanzee on government e-mail servers somewhere–and there probably are now, even as I write this.Comment: For more on the subject, see The Science of Racism and Our Broken Justice System.